On my home from visiting the snowdrops at the Abbaye de Beaulieu this week, I took a little side road at Cornusson. As it wound up out of the valley, this view of the Chateau appeared. 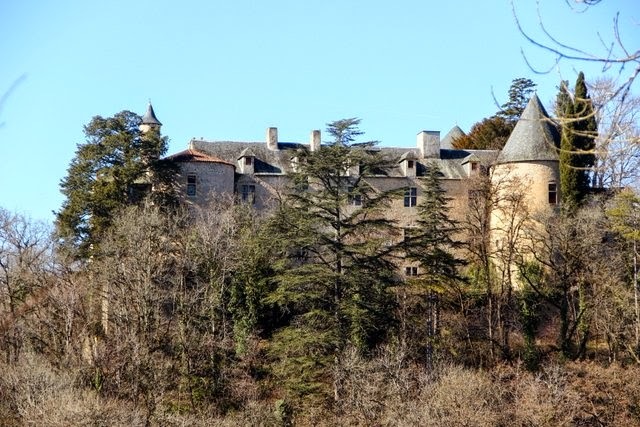 You can see from all the bare trees that in the summer you would see very little of Chateau which is very difficult to photograph any time of the year. In the spirit of full disclosure, the road didn't go where I thought it would....I ended up on a muddy track entering someone's farmstead. Oops! But this view of the Chateau was worth the detour.